With over 100,000 apps in its sleeve, Apple, beyond any doubt, has the largest number of Apps in its App Store. There is an App for almost anything that you can think off. 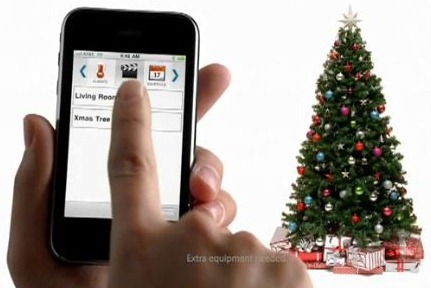 To show off apps for 2009 Christmas eve, Apple today has released a new iPhone 3GS commercial which shows 12 apps you to enjoy your Christmas with. Twelve cookies cooking, Eleven cards a sending, Ten gifts for giving, Nine songs for singing, Eight bells for ringing, Seven slopes of skiing, Six games for playing, Five gold rings, Four hot lattes, Three flights home, Two feet of snow and an app that can light up the tree. I saw the app that turns on the Xmas lights and had to look it up. I found out it is called, Schlage LiNK.